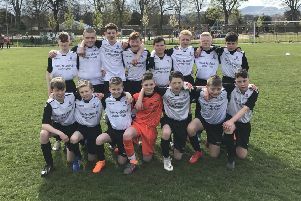 Tollcross Thistle increased their lead at the top of the Premier Division table to seven points as they inflicted a 5-0 defeat away on rock-bottom Fernieside. Alan McKay’s men are in pole position for the title with Salvesen sat in second place, although they have three games in hand over the league leaders. Colin Chalmers opened the scoring for the visitors with fine moment of individual skill. After receiving possession from Steven Milne he skipped past two players before cutting inside and finding the top corner. Stewart O’Neill was quickest to react after Sam Thomson’s effort wasn’t held by goalkeeper Scott Walker and he netted the rebound. The third arrived courtesy of some good awareness from Chris Cairns who spotted Walker off his line and lobbed the ball into the net via the crossbar. Tollcross were in full control and further strikes from Andy Crichton and Calum Frain capped a good day at the office. Lothian East table toppers Lauriston Thistle Saturday’s bounced back from back-to-back defeats as got back on track in their pursuit of consecutive league titles with a 6-2 defeat of Cockenzie Star. Last season’s Intermediate League champions hadn’t tasted a league defeat in 18 months until earlier this month when they were thrashed 6-0 by Pathhead. They then went on to lose 2-1 to Heriot Watt in the Centenary Cup but were back to their best at the weekend with the addition of former Livingston youngster Ryan Currie aiding their cause. Striker Josh Brew broke the deadlock after 11 minutes in Port Seton – the goal having been coming after several missed opportunities early on. The hosts pulled a goal back before the break, but Lauriston would really turn the screw after the interval with the introduction of Garry Dunn and Jordan Currie sparking them into life. Indeed, it took less than a minute of the second half for Lauriston to regain their lead as recent singing Paul Dickson made an instant impact as he curled a free-kick into the net from the edge of the box. Joe Fox made it three from centre midfield before Cockenzie pulled a goal back from the penalty spot. Left-back Jordan Bruce’s surging run brought Thistle’s fourth of the afternoon with five minutes remaining. There was still time left for midfielder Dickson to trump his earlier strike as he netted from inside his own half and then Fox grabbed his second of the afternoon.